Ed DMX returns to his long lost 101 Force moniker, a name he originally used way back before DMX Krew even existed in the very early 90's. Together with the change of name comes a change of emphasis - and it's more than welcome. Gone are the plastic electro shenanigans of more recent DMX Krew emissions and back come in classic analogue ACID stylings that make for Ed's most on-it material in recent years. "Axid V.2" opens the twelve with a classic ACID line that does the right thing and refuses to get too frantic - leaving the space and the analogue equipment to deliver the message with nothing more then a woodblock hit, arpegiated bass and loose vocal phrasing - killer stuff. 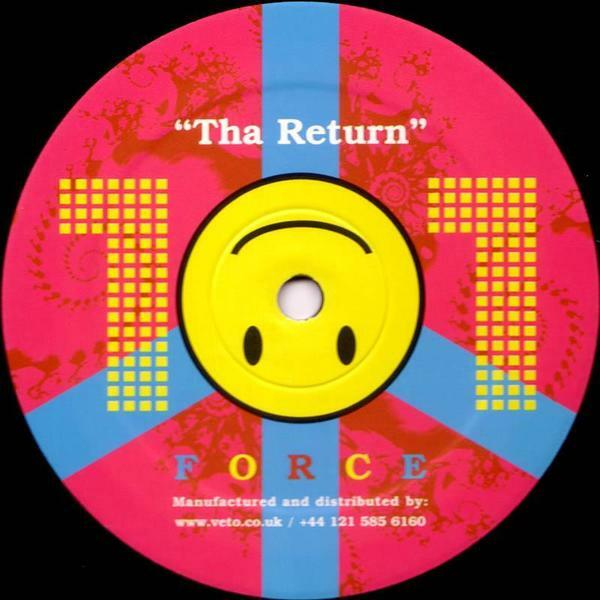 "Acid Under" and "Acid Trip" on the flipside stick to the brief - bits of classic UK rave sounds thrown in for good measure and (alongside the acid smiley that adorns the centre-labels) the spirit of '88 is brought back to life almost effortlessly. Righteous.